Taxes aren’t just crucial for public spending – used properly, they can be powerful tools for promoting inclusive global growth. The past few decades have been extraordinarily fruitful for global wealth creation. Since the end of the Cold War, the spread of free markets and trade around the world has reduced the cost of commerce and driven up living standards everywhere. 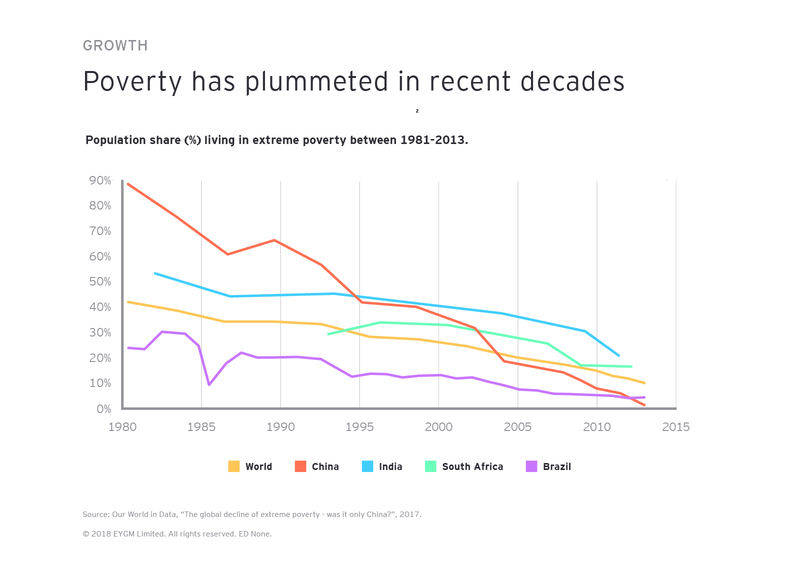 The number of people living in absolute poverty has decreased significantly, declining from 1.9 billion in 1990, to 836 million today, according to UN figures. In 1990, almost half of the population in developing countries lived on less than $1.25 a day. By 2015, the UN was reporting that that figure had dropped to 14%. 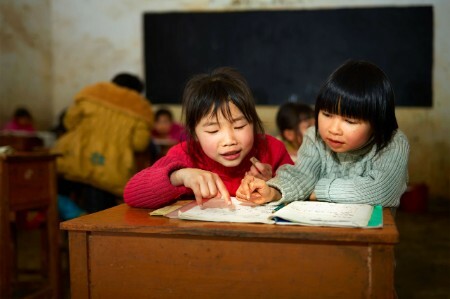 This has gone hand in hand with improving living standards, as reflected in a range of metrics, from rising rates of literacy to declining rates of infant mortality. Developing countries aren’t just the beneficiaries of this trend – they are driving it, with 147 of the Fortune 500 based in developing countries. However, the history of global growth is not an unambiguously positive one. While absolute levels of wealth have risen, so too has the gap between the richest and the poorest. The Organisation for Economic Cooperation and Development (OECD) now puts this gap at a thirty-year high – in 2013, the richest 10% of the population in OECD countries earned 9.5 times more than the poorest 10%. This isn’t just bad news for those at the bottom of the pyramid – any system that can’t deliver benefits to all is unsustainable, and runs the risk of collapse. Discontent with the distribution of wealth has found increasing political expression around the world, with electoral victories for a broad range of anti-trade, anti-globalist politicians and policies. “Any system where too many people get left behind is sowing the seeds of its own destruction,” says Paul Polman, Unilever CEO and contributor to EY’s latest Tax Insights. 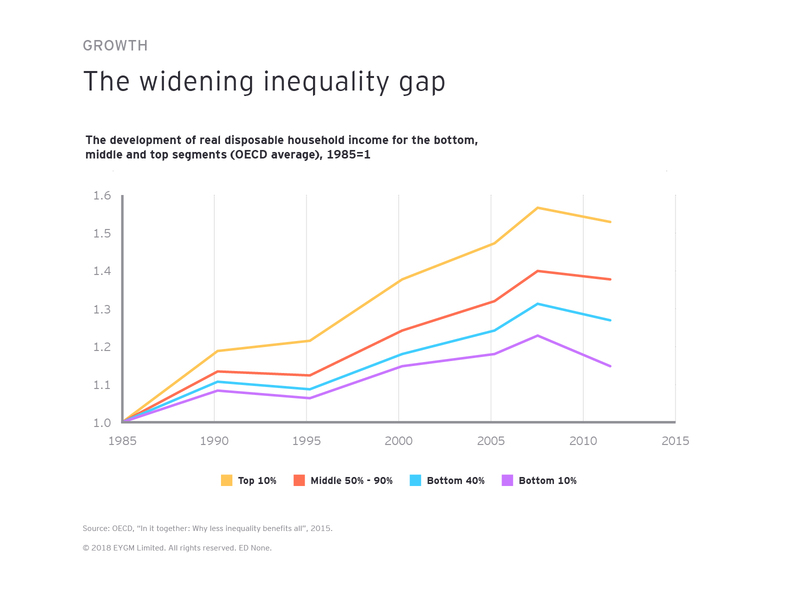 The inequality gap threatens to undermine the very forces of progress that for the last several decades have been lifting millions of people out of poverty. Are better taxes the key to more inclusive growth? Nobody likes being taxed. Nor are taxes necessarily good for growth. All taxes are broadly distortive to the way a normal economy functions, as they bypass classical rules of supply and demand. This means that they are theoretically a drag on economic activity. Nevertheless, they are essential for funding those public projects and services that keep the world turning – for everyone. Therefore, fiscal legislators the world over must aim for an approach to taxation that can balance the need to sustain global growth, while making sure that the fruits of that growth are shared more inclusively among the global population. Broaden tax bases: Not all taxes are created equal. It’s generally recognized that taxes on consumption, rather than on production, are best for the economy, but this can’t work all the time – a government would simply not generate enough revenue on consumption tax alone. Therefore, policy setters should look a setting low taxes, but over a broader range of activity. “The consensus has been that, for income taxes, low rates plus a broad base favor economic growth.” says Victoria Perry, Assistant Director, Fiscal Affairs Department, IMF. Broad tax base measures include VAT and real-estate tax. These moves should be accompanied by policies that redistribute tax along a similarly broadened social security base. Not only is this good for equality, but it also supports a wide range of consumer spending, stimulating the wider economy. Most jurisdictions are constantly adjusting the proportion of revenue from different levies to obtain the revenues they need without impeding growth. Strengthen overall progressivity of the fiscal system: A progressive tax system is one where the rate of tax increases as the taxed amount grows, and policymakers should try and ensure this approach is applied throughout their tax codes, even beyond personal income tax. For a tax system to be truly progressive, it's also important that policymakers strengthen the link between taxes paid and benefits received. Shaping pre-tax behaviors and opportunities: Tax can also be used to shape the behavior of those being taxed, by alternately penalizing and encouraging certain activities in ways that promote growth. “Tax policies that support innovation and R&D, and which invest in people, will underpin future growth,” says Polman. Taxes that promote this can include R&D grants, tax breaks on innovator wages, and lower rates of taxation on recently patented products. Enhance tax policy and administration: Just getting better at collecting already-existing taxes can help realize public spending with implementing economically distortive practices. This includes making sure new taxes are designed to be easy to implement, strengthening the administrative architecture around taxation, tackling tax avoidance and evasion, and improving how statistics around taxation are collected and analyzed. As the increasing level of global inequality and the anger it engenders demonstrate, total growth should not be the only priority for government and business. It’s also important this growth is truly inclusive enjoyed by everyone. Tax reform will not be a catch-all solution. But if applied properly it can provide the foundations for dynamic and equitable global growth. “Today’s world is an uncertain one: economic growth is patchy, while income inequality is on the rise. As governments look for solutions, we’re once again seeing an increase in protectionist measures,” says our Global Chairman and CEO Mark A. Weinberger. Tax reform will not be a catch-all solution for social inequality. But if applied properly it can provide the foundations for dynamic and equitable global growth.